I thought I would post a prom picture with Damis and his friend that accompanied him, Dania. We were mowing that day so we weren't at home so they stopped by to show us what they looked like. I grabbed David's phone & took a picture with that...did I mention we were mowing a cemetery at the time? So outside the gate is where the picture was taken. Damis' tux was color coordinated & so where the flowers! Also a few weeks back I finally purchased one of my favorite trees; a mimosa tree. We planted it and I checked on it the other day & it had a 'flower!' I was so excited I took a picture of it! Great picture from the prom. Hard to watch them grow up, isn't it? Love the tree. I've never seen one before. It's beautiful. 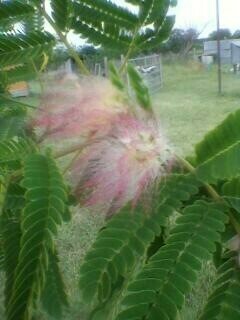 Mimosa tree's are so fun to sit in. They hide you and give the best shade. My grandma had one in her yard for years, and I stayed in it all the time. I don't see them much in Texas...guess they are all in San Antonio!! I think that is the type of tree that is in our neighbor's yard! So pretty! Subject: Re: Prom & my tree!